How do I buy an Acai Express Franchise? The very first step to being a business owner in the fast growing acai market is to complete and submit the Acai Express franchise inquiry form. 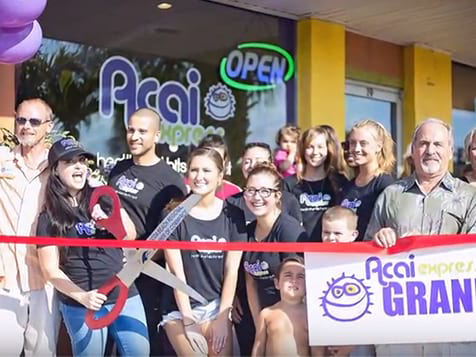 From there, buying your own The Acai Express consists of an investment of an initial franchise fee of $20,000, and a total investment between $105,400-$261,000. The Acai Express team will provide training, ongoing support, business tips and operational guidance. 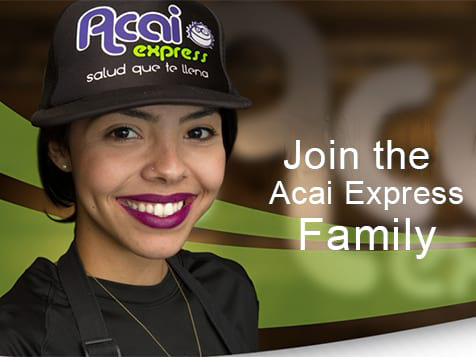 Invest in a Healthy Opportunity with Acai Express. 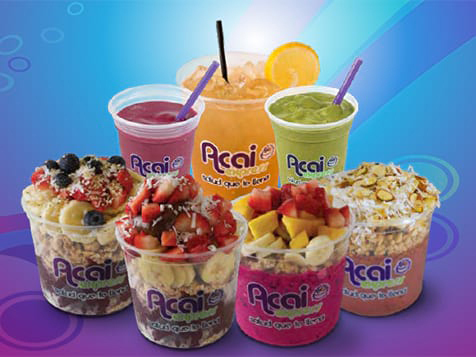 Our goal at Acai Express is to provide the public with natural, fresh, delicious, organic Acai Bowls for on the go. With an already successful business model, other like-minded entrepreneurs can have the opportunity to start their own business with a very economic financial structure. Open Acai Express in any of these available states: AL, AZ, AR, DE, FL, GA, LA, MS, NJ, NC, OH, PA, SC, TN. Acai Express’s fruit-packed bowls of sun-drenched goodness invite our customers to savor the taste of a healthy lifestyle. Our acai bowls are a gift to the explorers and the wild-at-heart. To the health-conscious who love having fun. To free spirits who believe life needs more flavor. Our menu of high-quality, organic ingredients and acai fruit pays tribute to the healthy surfer lifestyle. There’s the “Surfer Bowl”, the “Rainbow Bowl”, the Wolfpack Bowl” (named after a Puerto Rican Jiu-Jitsu academy) and more. Each bowl, smoothie and juice is an invitation to the curious-minded to join us in a nourishing adventure. We’re expanding to the U.S. in 2018 and hope you’ll join our franchise family there. The Ingredients in Our Acai Bowls Aren't Only Delicious: They're 100% Unique. Our acai berries are grown within the Amazon rainforest. This discourages deforestation, which usually occurs so the population can farm cattle and corn for the ethanol industry. Demand for acai berries gives the Brazilian people an incentive to preserve the rainforest in order to harvest them. We also support local farmers and businesses, and buy organic, local produce wherever possible. Because we believe that healthy lifestyles are flavorful lifestyles, we work hard to source the highest-quality and most fresh, delicious ingredients available. The story took another turn when, in the summer of 2015, Hector traveled to the city of Belem in Brazil’s Amazon rainforest. There, he learned about the acai berry’s origins and how it gets harvested and produced. The trip inspired him to deepen the company’s links with Brazilian communities. 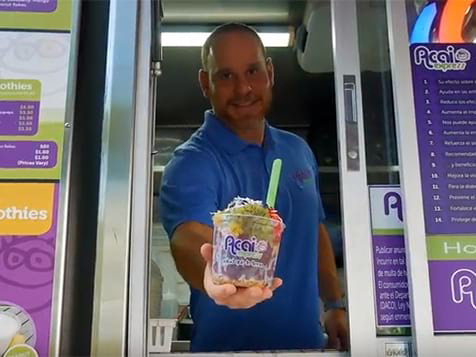 He established a relationship with one of Brazil’s most prominent acai growers, enabling Acai Express to use 100% organic Grade A acai (the highest quality available). Plus, he secured a private label and recipe strictly for the Acai Express brand. Today’s consumers are much more proactive in their approach to health and wellness. Progressive health and wellness consumers are increasingly influential in redefining food culture. According to Forbes, a focus on health, wellness, and sustainability is present at the most progressive food retail and food service outlets. And for all the quick-service twists and turns that 2017 will be remembered for, industry experts see one trend standing head and shoulders above the rest. It was the year food finally became our friend - when Americans began to care less about diets and more about food quality. Case in point: 88% of people from Generation Z to Baby Boomers are now willing to pay more for healthier foods (PopUpCookSpace). Calling 2017 the year of the bowl is also not an overstatement, says Melissa Abbott, Vice President of Culinary Insights at The Hartman Group (QSR magazine). Some bowls were loaded with salad or protein-infused; others were filled with grains and veggies. Chains like Sweetgreen and Cava Grill are bowl havens and growing fast. Like quinoa before it, acai has become a sought after food growing in popularity among health-conscious Americans. One of the biggest 2017 summer food trends was the acai bowl - a dream breakfast with a delicious appearance, taste and aroma (NYTimes). The largest segment of the global acai berry market lies in the food and beverage sector, and is poised to remain that way. According to FutureMarketInsights, the acai berry market was valued at over half a billion dollars in 2016, and should hit nearly two billion US dollars in revenue in less than 10 years. The latest acai berry variety to get noticed is Brazilian acai: a purplish, antioxidant-rich stone fruit (though most people call it a berry) foraged from trees in the Amazon River basin. Acai Express uses the best quality of this berry – which is 100% organic and processed using an exclusive recipe – in its bowls, juices and smoothies. 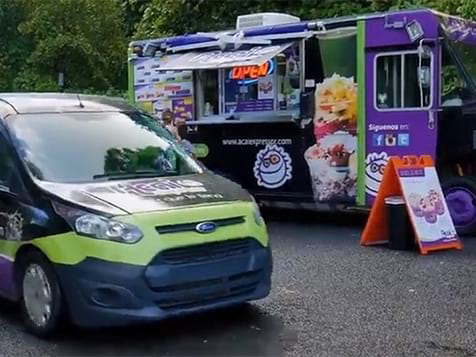 Franchises in this segment have seen a significant boost from the public’s embrace of healthier food options. 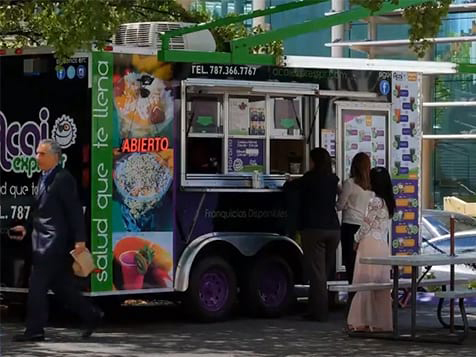 Regulations banning soda machines from school have led franchises such as Jamba Juice to create vending machines for their products, opening up a new avenue for sales. The Juice and Smoothie bars industry has also grown steadily over the past five years as operators have adapted to rapidly evolving consumer preferences (IbisWorld). Acai bowls have all-day potential – they can be a healthy lunch or dinner, or a delicious snack to grab on the go. Overflowing with fruit, they’re eye-catching and easy to experiment with. You can create adventurous new recipes and appeal to each customer’s unique tastes by offering customization and innovation. You will be able to use all of our branding, plus have access to crucial tools to help your business succeed. This includes exclusive information about time-tested, quality equipment and technology, expert social media and marketing advice, and recipes and operational methods for your business toolkit. Given the enormous – and growing – popularity of healthy fast-casual dining, our demographic is highly diverse. Though the majority of our client base is currently made up of women aged 13-45, we are delighted to be welcoming new customers from all segments of the market. We believe strongly in maximizing customer satisfaction and guest experience by providing ongoing training to our franchisees that stresses the importance of excellent customer service. Take the next step and inquire to Acai Express today. AL, AZ, AR, DE, FL, GA, LA, MS, NJ, NC, OH, PA, SC and TN. Acai Express is not currently active in our directory, but here are some other recommended selections for you to explore.